The US South is home to some of the most beautiful and important forests in the world. They provide us with clean air and water, protect us from storms and flooding, and are homes to unique plants and animals. Our forests are a special part of our cultural heritage. But our Southern forests are also ground zero for destruction. 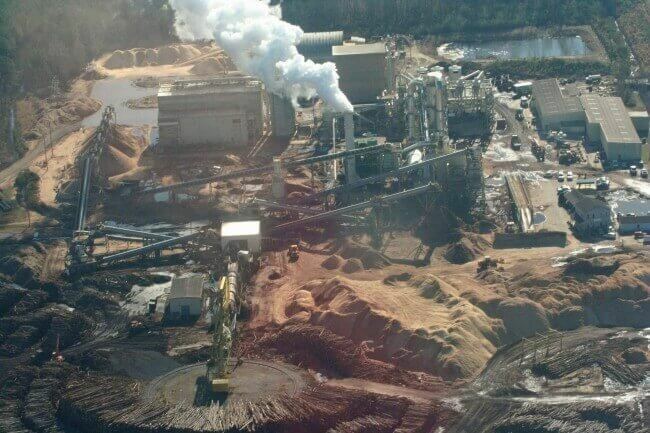 Corporations like Maryland-based Enviva, the world’s largest wood pellet manufacturer, continue to set up shop across the South to turn huge swaths of forest into wood pellets and then ship them to Europe and Asia to be burned in power stations for electricity. Send your personalized public comment to MDEQ today urging them to deny Enviva’s permit application. Now, Enviva wants to build a new facility in Lucedale, Mississippi. We just got word that the Mississippi Department of Environmental Quality has issued the draft permit that would allow Enviva to proceed with construction. We can’t let that happen. If built, this plant will be by far the largest wood pellet plant in the world, with a capacity to produce 1.4 million tons of wood pellets per year. Overhead view of Enviva’s facility in Ahoskie, North Carolina. The Ahoskie plant is less than a third of the size of the proposed Lucedale plant. To feed a facility of this size requires up to 130,000 acres of forests per year. That’s the equivalent to logging an area nearly the size of Chicago – every single year. This plant would be as big, as dirty, and as destructive as three of the existing large Enviva facilities combined that are currently having such a harmful impact on the forests and communities of North Carolina and Virginia. If built as Enviva intends, this plant will be truly massive in its size and destruction. Piles of trees in front of Enviva’s Ahoskie facility (2015). Trucks just like these enter the pellet facility at estimated rates of 10-25 trucks per hour. 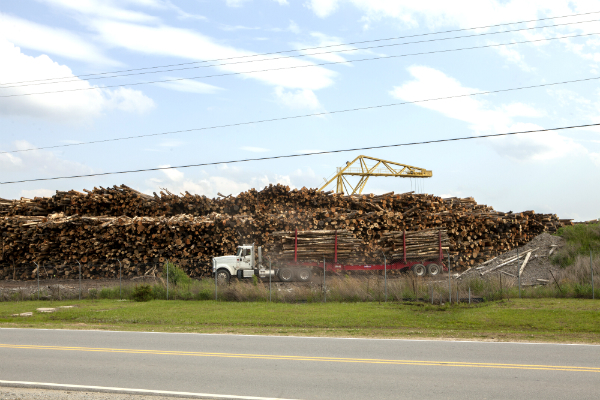 Enviva estimates that 300 trucks per day will deliver logs to their proposed Lucedale facility. Destroying our forests and burning them for electricity is a false solution to economic development and to solving the climate crisis. Burning trees for electricity is dirtier and worse for the climate than burning coal. The Enviva Lucedale plant would be a huge emitter of greenhouse gases (GHG) and other toxins that would harm the local community’s health. If built, the Enviva facility and the pellets it produces will be one of the top 5 largest sources of GHG emissions in Mississippi. The GHG emissions from the plant and the pellets it produces would be roughly equivalent to a 500 megawatt coal plant. We’re in climate crisis, and we need real solutions now — like transitioning to 100% truly clean, renewable energy, and protecting our forests — not more dirty industry and false solutions. If industrial logging was the answer to economic development, rural Southern communities would be some of richest in the world. But the truth is that communities reliant on logging face some of the highest poverty rates. Lucedale, a community named after its founder in the lumber business, is no exception. We have been exposing the truth about this industry for years — from on-the-ground investigations, to local public hearings, to the international stage. Again and again, Enviva has deceived the public, policymakers, and investors about their sourcing practices, environmental impact, and economic value. Here’s the truth: Enviva profits by destroying and exporting our forests, harming our communities’ health and quality of life, and imperiling our efforts to avoid a climate disaster. We’re gearing up for a big fight in Mississippi. Take Action: Send your personalized public comment to MDEQ today! Agreed! We have to keep fighting for our forests. Please join us in sending a public comment to MDEQ. You can find the action page here: https://www.dogwoodalliance.org/actions/no-enviva/ Thank you Connie! The Enviva plant needs to be stopped – what do we need wood pellets for anyway? Pellets that require a forest the size of Chicago to be destroyed EVERY YEAR. WE ARE RUNNING OUT OF FORESTS!!!!! Surely they can devise an environmentally friendly substitute (NOT plastic!!!) for them? Please let me know what I can do! Yes it does! We do NOT need wood pellets – in fact they are just making the climate crisis worse! Cheaper, cleaner options are available – like wind and solar. Please join us in sending a public comment to MDEQ. You can find the action page here: https://www.dogwoodalliance.org/actions/no-enviva/ Thank you! To build such a factory for what will presumably be sold as “a source of renewable energy” is a blatant case of Greenwash and will leave huge areas as desert (or will there be any obligation to re-forest the clear-cut areas? – and if so, how long will it take before the areas are forest again (forest which we need for the binding of carbon dioxide)? The wood pellet industry is a total case of greenwashing, and it has got to stop. There is no obligation to replant. Landowners may replant, but this cannot replace the forests that were destroyed, especially if they are replaced with a pine plantation. Even with regrowth, it takes 60-90 years to reach parity (carbon neutrality). Please join us in sending a public comment to MDEQ. You can find the action page here: https://www.dogwoodalliance.org/actions/no-enviva/ Thank you! what you can never replace !!!!!!!!! Exactly! Please join us in sending a public comment to MDEQ. You can find the action page here: https://www.dogwoodalliance.org/actions/no-enviva/ Thank you! This pallet industry is too wasteful to be built. Let’s get our priorities straight. It is a total waste. Please join us in sending a public comment to MDEQ. You can find the action page here: https://www.dogwoodalliance.org/actions/no-enviva/ Thank you!